Free fuel and other hot deals | What Car? Looking for a bargain this weekend? Here are the best car-buying deals we've found to help you save cash. 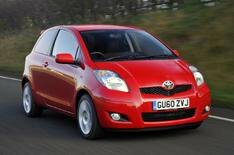 Toyota is offering free fuel to customers who buy a Yaris this month. It will give customers who buy a 1.0-litre VVT-i version a fuel card with 548.15 of credit. It can be used to buy fuel at any UK petrol station. That's enough to cover around 5000 miles, says Toyota. Our mystery shoppers were offered a 1.2 LS for 7715 that's a 1700 saving. Our contacts are confident that Mazda will continue its two-year, zero deposit, 3.9% PCP on all versions. We've managed to get 836 off a 1.4 TB 120 Turismo, leaving 16,614 to pay. Online broker Coast2coastcars.co.uk can save you 1823 on a 1.4 TSI Match. Price you pay: 17,086. You should be able to get a 500 finance deposit contribution when you buy using a low-rate APR Ford Credit Finance plan. Confirm this with your dealer. We haggled 2547 off the 1.8 V-matic TR at a dealer, which dropped the price to 17,568. We were offered a 2.0 TDI 143 S line for 26,195 that's a 2825 discount. Coast2cars.co.uk has a 530d M Sport for 39,152 a saving of 2923. Save a whopping 6305 when you buy a 3.0 HDi V6 Exclusive from Carfile.net. Price: 32,390. Coast2coastcars.co.uk has a 2.0 CRDi 136 Style 2WD for 17,850 1295 off the list price. We haggled 3976 off a 1.7 CDTi 110 Ecoflex Exclusiv at a dealer. Price: 16,373. Volvo XC90 We were quoted 30,756 for a 2.4 D5 200 R-Design at a Volvo dealer that's 9129 off the list price.